Because Valentine’s Day is in February, many people have romance on their minds. While I am a multi-genre author, I’m devoting my Monday posts this month to the work I’ve written in the romance genre. This week, I’d like to introduce you to Love Set in Stone, a paranormal romance releasing as part of a boxset in Spring 2016. This set includes many talented authors writing books about familiar supernatural creatures—ghosts, vampires, shifters, magicians. And some not so usual entities—like mummies and gargoyles. Based on the cover art and the title, I’m guessing you figured out I wrote the gargoyle piece. Love Set in Stone is inspired by the poem “God Bless the Gargoyles” by Dav Pilkey. It tells the story of Damien, a warrior who became a gargoyle to protect the innocent and, over the centuries, lost his purpose. Until he meets Rina, a down-on-her-luck woman he can’t help but try to protect. Will he be able to save her? Is their love strong enough to withstand the evils of this world? “What?” Her beauty blinded him. He couldn’t think straight, couldn’t find the words or the willpower to walk away. Then she walked toward him. What was she doing? What did she want? What did they need to get out of the way? Details of his name? His occupation? His thoughts reeled with panic, confusion, worst-case scenarios. She stood toe-to-toe with him, looked up into his eyes. He saw the light dusting of freckles across her nose and cheekbones, heard her sharp intake of breath. Was she as nervous as he? Why? And he couldn’t think at all. So, there you have it. A brief glimpse at Love Set in Stone, coming this spring. I’d love to hear what you think. 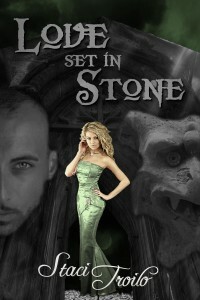 Does a gargoyle story intrigue you, or do you prefer the classic paranormal creatures? Do you read or write PNR? What are your favorite elements? Let’s talk about it. What a tease. Definitely got my attention, and I cannot wait to read it. You are one busy lady! Interesting story line and I’m sure the story will be equally intriguing! I have set some ambitious goals this year. Fingers crossed! I love the gargoyle angle! Very intriguing. Thanks, Missy. I’m not sure if PNR is really your thing, but it was fun to write. I’ve always had a soft spot for creatures, and gargoyles definitely intrigue me. I remember the first time I’d ever heard of one was from some movie I watched as a kid. I can’t remember the name of it, but I was hooked. Like I said…creature fascination, LOL. My first release, WEATHERING ROCK, was a paranormal romance involving a werewolf. I read a lot of the genre and will be looking forward to this release. The excerpt has me intrigued! Well, you know you and I seem to have similar cryptozoological tastes. I won’t go so far as to say I believe gargoyles come to life at night, but I do find the premise interesting!